Thank you for bringing your concerns to our attention. We never want our customers to be disappointed in the work that is done in their homes, and we would like to know more about the issues that occurred with your installation. Unfortunately, we cannot locate your account with the information posted here. Please send your contact information to customersupport@empiretoday.com so that we can follow up with you and work towards a resolution. 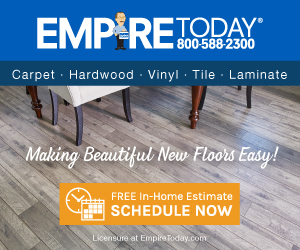 Empire Today = rude installation manger+ bad quality carpet+ unprofessional customer service . It is a rip off . Review #781818 is a subjective opinion of Hannah41. Thank you for bringing your concerns to our attention. We never want our customers to be disappointed in the work that is done in their homes, and we would like to know more about the issues that occurred with your installation. Please send your contact information to customersupport@empiretoday.com so that we can follow up with you and work towards a resolution.